The below listed web site addresses bank robberies in the Southern California area. 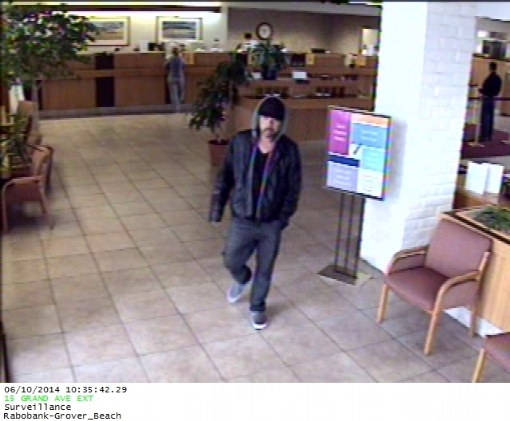 Robberies specific to San Luis Obispo County will be featured here as appropriate. 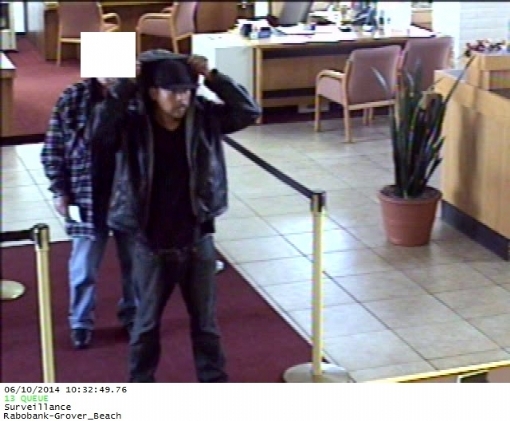 On June 10, 2014 at about 10:37 a.m., Grover Beach Police Officers responded to RaboBank located at 899 W. Grand Ave, Grover Beach, CA, for a report of a silent alarm. Officers arrived at approximately 10:39 hours and confirmed a robbery occurred. The suspect displayed a black semi-automatic pistol and was described as being an Asian or Filipino male adult. The amount of money stolen has not yet been determined. 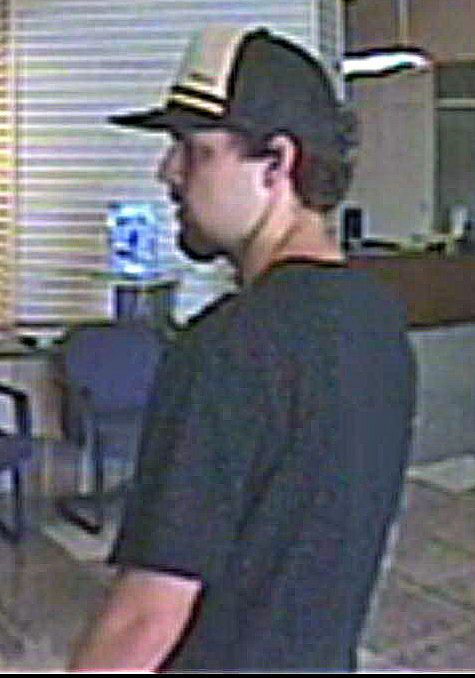 Included are photographs of the suspect captured by the bank’s surveillance cameras. 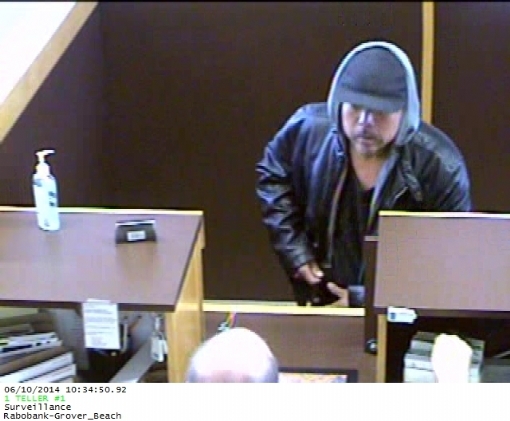 The suspect is described as an Asian or Filipino Male with an accent, Mid 30s to 40s, 5`6" to 5`9" with a Medium build, Salt and Pepper goatee with thin mustache, wearing Dirty "sagging" blue jeans and tan or brown slip on tennis shoes. Anyone with any information regarding the suspect is encouraged to call the Grover Beach Police Department at 805-473-4511, or remain anonymous by calling Crime Stoppers at 549 STOP (549-7867). You can also text your tip to Crime Stoppers by texting "SLOTIPS plus your message" to CRIMES (274637) or submit your tip through this website. 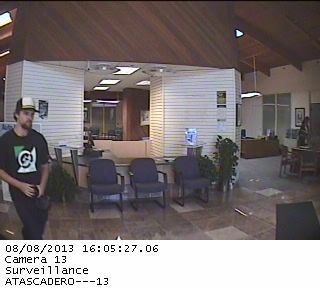 SUSPECT DESCRIPTION: Suspect 1 who entered the bank was described as a male White in his early to mid 20’s, 6’0”-6’1” tall and 165-175 lbs. He had brown curly hair, a mustache and goatee. 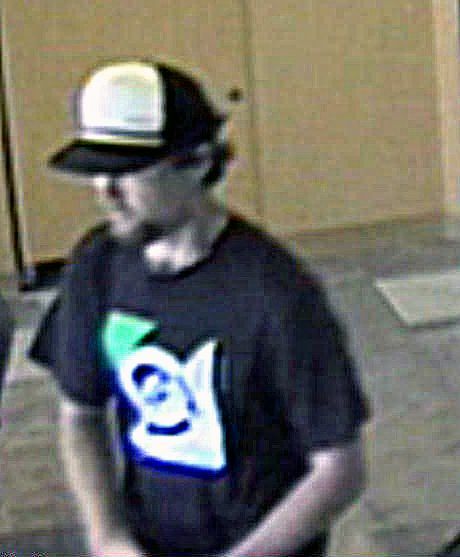 Suspect 1 was wearing a baseball cap that was black and white with a black brim. 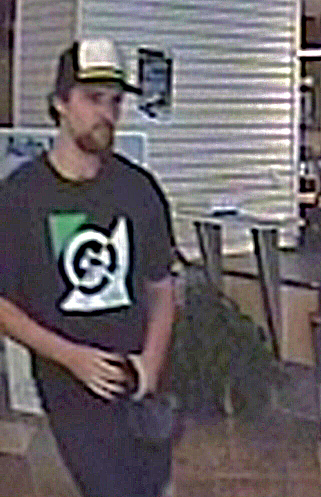 He was also wearing a black short sleeve T-shirt with a white and green design on the front and dark colored pants and shoes. Suspect 2 was described as a male, with no further description provided. SUSPECT VEHICLE: The suspect possibly fled the scene in what was described as a white four door Mitsubishi sedan driven by the second suspect. The vehicle was last seen heading toward the intersection of Pueblo Ave and San Luis Ave in the city of Atascadero and may have gotten on the 101 Highway at Curbaril Ave. This incident is currently under investigation and the Atascadero Police Department is asking for help in identifying the suspects. 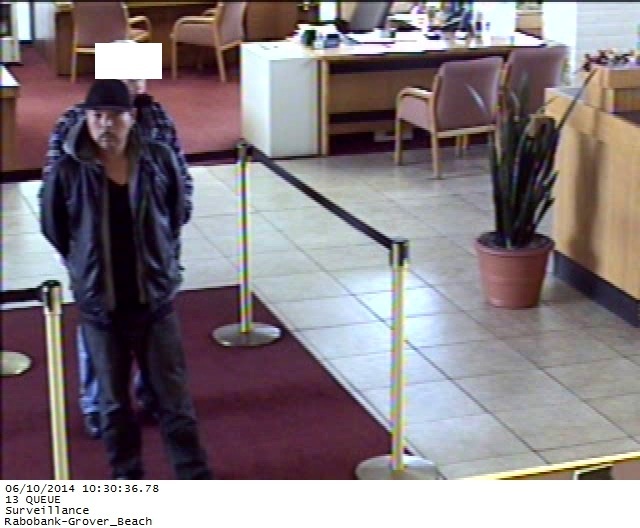 Attached are photographs obtained from the bank of Suspect 1. If anyone has any information related to this incident they are encouraged to contact the Atascadero Police Department’s Investigation Unit at (805)-461-5051, or remain anonymous by calling Crime Stoppers at 549 STOP (549-7867). You can also text your tip to Crime Stoppers by texting "SLOTIPS plus your message" to CRIMES (274637) or submit your tip through this website.